Modernscientist is a female biophysicist at a major research institution in New York City. Her research utilizes a technique called Nuclear Magnetic Resonance (NMR) to study biomacromolecules. Currently a postdoctoral fellow, she hopes to make the jump to professor in a "few" years. She will attempt to blog with humor about biophysics, biochemistry, being a postdoc, and her life as a female scientist. Enjoy! As I studied nutrition and learned about the role of proteins, carbohydrates, and fats in the body’s catabolic and anabolic processes, I continually felt like I was being shammed. I felt there had to more to this hodgepodge of long chemical names and how they were turned into muscle and fat cells than I was being told. I wanted to know more. I wanted details. Enter: college biochemistry. I was hooked after only a couple weeks of learning about the synthesis of amino acids from various precursors and how these amino acids were combined to produce, among other things, enzymes. For your enjoyment, I’ve included a picture of my favorite enzyme from college biochemistry, Triose Phosphate Isomerase (TIM). I adore TIM because it is an example of what I attempted—and failed—to achieve with my teenage nutrition experiment: catalytic perfection. In enzymology, this term means that TIM’s productivity is limited only by “external” factors, such as the binding of substrate, rather than its own ability to catalyze the reaction. Fast forward to today. I’ve expanded my list of cool biomacromolecules to include those composed of nucleic acids, but I’m still big on the details. My research focuses heavily on a technique, Nuclear Magnetic Resonance (NMR), that provides atomic resolution information about the system of interest. Specifically, I use NMR to understand the way in which biomacromolecules, including enzymes, move. This movement is critical to a variety of processes, including catalysis of reactions, the binding of drugs, and the communication of signals from external stimuli inside a cell. You know, pretty much everything that makes life possible. 1. 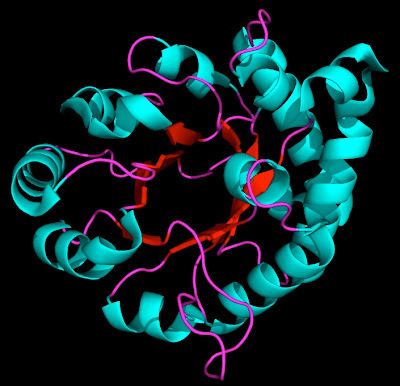 RCSB Protein Data Bank entry for the crystal structure of Triose Phosphate Isomerase. 2. Journal article reporting the structure of Triose Phsphate Isomerase: Kinoshita, T., Maruki, R., Warizaya, M., Nakajima, H., & Nishimura, S., 2005, Acta Crystallographica. Section F, Structural Biology and Crystallization Communications, 61(Pt 4), pp. 346-9. Next: "My New Favorite Toy" or "Why You NEED to Win the iPad from LabSpaces"